Whether youâ€™re part of the search industry or just affected by it, youâ€™ve probably not only grown used to change but are excited by it. 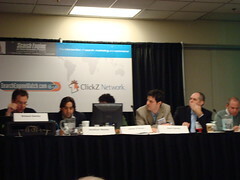 Attending a session this morning about personalized and universal search, we had a panel full of excited folks and audience members all bursting at the seams to discuss what these two types of search bring. Bill Barnes, Co-Founder & Executive Vice President, Enquiro Search Solutions Inc. The start of it all is Google making its personalized search much more the default for many users, shaping search results based on a number of criteria. As well, its roll out of universal search. The engine understands user behavior and his/her interactions with web pages including: click through, time to return to the engine, type of query. The compilation of this data not only affects that usersâ€™ future results, but also the results of similar searchers. Google will be assigning value to each searcher and will be used to grade his/her activities on a website. This will affect the ranking of websites based on individual activities on the site. The more trusted the user, the more it will affect results. Google will assess your membership in communities. As well as comparing common bookmarks and search behavior of other searchers. How does Universal search work? Basically, the engines have stopped ignoring the â€˜otherâ€™ types of information on the net including images, videos, news sites etc. Do a Google Search for Hillary Clinton and youâ€™ll get a good feel for universal search (if our results are similar of course 🙂 ). 3. Make peace with the fact your universe is only so big. Reverting back to lessons learned from Seth Godin yesterday, itâ€™s about the whos, not how many. View more photos from SES Chicago.